COREY TAYLOR REBRANDS AND RELAUNCHES HIS NEW WEBSITE! Section 101 client Corey Taylor has recently re-launched his website with a full re-branding created by Corey and executed by the Section 101 team. 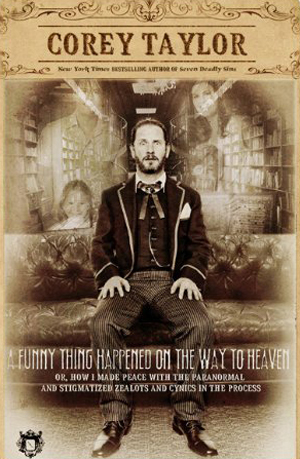 The new look for https://thecoreytaylor.com/ is based on the creative for his new book, A Funny Thing Happened on the Way to Heaven, which has been released in the US today, July 16th. Released in the UK last month, this is Corey’s second book following his memoir, Seven Deadly Sins. A Funny Thing Happened on the Way to Heaven takes readers on a hell of a ride, as Corey delves in to the supernatural with his tales of his up-close and personal relationship with the paranormal. Sceptic or believer, you won't look at ghosts - or Corey - the same way again. Readers on both GoodReads and Amazon.co.uk have given the book 5 out of 5 stars. Along with being a published author and fronting both Slipknot and Stone Sour, Corey has a line of comic books that are an off-shot of a Stone Sour double album called House of Gold and Bones. Number 4 in the much-anticipated series is coming out at the end of July.